X-MEN GOLD #35 concludes the Storm-centric “Godwar” arc with a huge battle between two very formidable “gods” — Storm and Uovo. 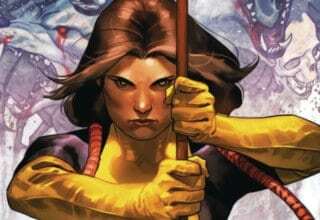 Writer Marc Guggenheim and artists Simone Buonfantino, Giovanni Valletta, and Erick Arciniega deliver one of the most action-packed issues of X-MEN GOLD that we’ve seen in a while, which is both a good and a bad thing. With only one issue left in the series, Guggenheim doesn’t have a lot of time to give Storm the attention she deserves. So, instead, he supplements X-MEN GOLD #35 by throwing in action scenes that don’t necessarily further Storm’s character. Still, action can make for an entertaining read — if a little shallow. Most of X-MEN GOLD #35 sees the hard-fought battle between the evil African god Uovu and Storm. Somewhere, between the first page and the last, the rest of the Gold team shows up, and Storm is reunited with her Asgardian Stormcaster hammer. As we all would predict, Storm smites the villain using her trusty hammer, but in doing so, she drains it of all of its magical energy. She also inadvertently returns all the zombie-fied villagers to the grave. This includes her parents, who she’s forced to say goodbye to. The issue ends with Storm vowing to come back and visit the village more often — as a friend and not as a goddess. If Guggenheim had four more issues to really develop the “Godwar” arc, I think this could have been a really enthralling, well-done story. He could have really dug into Storm’s childhood, her grief over her parents’ deaths, and, perhaps most importantly, her role as a “goddess” in her village. Guggenheim is clearly trying to comment on Storm’s assumed “goddess” status, which defined her early years as a mutant. Is Storm really a goddess? When armed with the Stormcaster, the answer seems obvious. In this issue, she used the Asgardian weapon to kill a god — a real god. Without her trusty hammer, the answer isn’t so clear. Storm is a powerful character. That much is clear. However, I think with this arc, Guggenheim wants to remind us of Storm’s humanity. She isn’t technically a goddess, and she isn’t an omega-level mutant. This arc brings Storm back down to Earth in a way that’s absolutely necessary for the development of Storm’s character. Storm has become much bigger than her roots. So, it’s good to see her return to her childhood and tackle those issues without pretension. With a little more time, Guggenheim could have made some lasting impacts on Storm’s character. Honestly, this arc would have been better suited for a solo-character miniseries. X-MEN GOLD #36 is the series’ last issue. 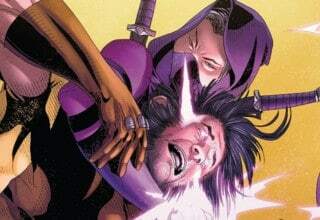 The past two arcs in the series have been focused on Rachel Grey and Storm — both of whom were severely underutilized throughout the rest of the series. I’ve mentioned before how I feel like Rachel and Storm’s arcs were last-minute add-ons that needed more fleshing out to be solid arcs. The conclusion to “Godwar” in X-MEN GOLD #35 really proves that. Yes, we get to see a different side of Storm, but the lack of development is detrimental. This issue jumps right into a battle that lasts almost till the end. 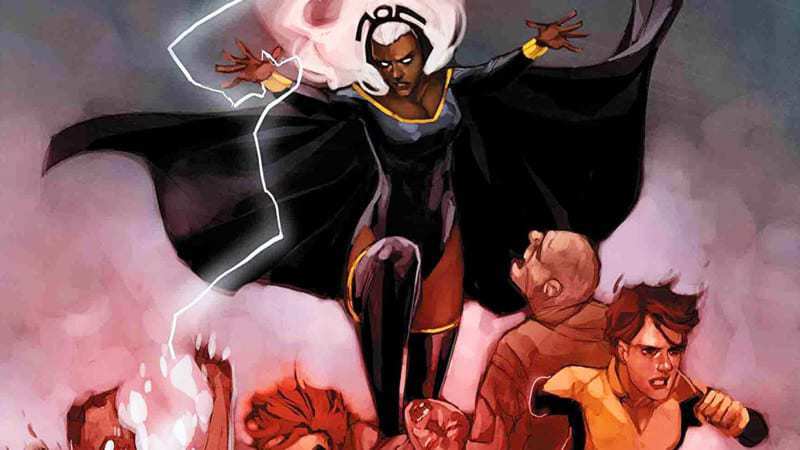 There isn’t enough time to create something that will have an impact on Storm’s character beyond the pages of X-MEN GOLD. That might be what makes me the most disappointed about this series. X-MEN GOLD has had its high moments. However, overall this series really struggled to give readers an entertaining and well-thought-out story. I love that Guggenheim gave Storm these last few issues. Though, I would have liked it a lot more if he had given her some panel-time during the start of the series instead of putting such a strong focus on Kitty. X-MEN GOLD #35 sees yet another artistic change, from Michele Bandini to the penciling duo of Simone Buonfantino and Giovanni Valletta. Ordinarily, I like to see the same artist work on an entire arc, from start to finish. However, in this situation, the artists’ styles are so similar that the change isn’t at all jarring. Buonfantino and Valletta give their characters slightly more expressive faces, and the action scenes are a little more dynamic than Bandini’s, but overall, it doesn’t feel like a huge change. Similarly, the new colorist, Erick Arciniega, brings a similar palette as past colorists on the series. The intense blues used during Storm’s action scenes to signify blinding lighting bolts are probably Arciniega’s best work in the issue. If you’re a Storm fan, X-MEN GOLD #35 is an issue you need in your collection. If you’re not a diehard Storm fan, I don’t think I would recommend this issue. 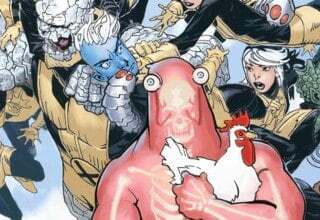 For X-Men fans looking for solid character development, Guggenheim’s hasty work with the weather-controlling mutant won’t cut it. Still, we do get to see Storm at her best — wielding the powerful Stormcaster. Bad plot design aside, that’s pretty awesome. Marc Guggenheim ties up the much-needed Storm-centric "Godwar" arc with a few too many perfect ribbons. Although an entertaining read, X-MEN GOLD #35 lacks the depth that an issue centered around such a personal topic should have. 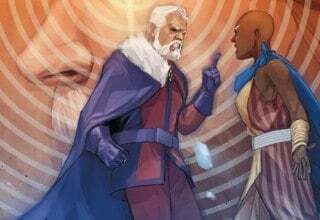 Still, Guggenheim does give Storm some needed characterization and artists Simone Buonfantino and Giovanni Valletta deliver some amazing work.